Preheat oven to 200°C/400°F. Peel and halve potatoes, and add to a baking dish. Crush garlic and add to baking dish along with rosemarys. 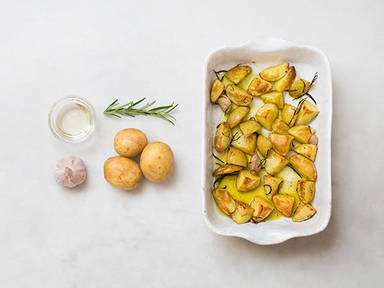 Season with salt and pepper, drizzle with olive oil, and toss well. Bake potatoes in preheated oven at 200°C/400°F for approx. 25 min. or until golden brown. Season to taste with salt and pepper. Enjoy!